Here's a nice view from one of the side roads off the lower powerline road that I explored this evening. I’ve been waiting for a few dry days in a row so I could revisit the lower powerline road (see here for previous post; I followed the road marked “another powerline road” starting from Buckhorn Road). I wanted to explore the numerous side roads. I captured a GPS track which turned out nicely. I had a very enjoyable ride exploring side roads connecting to the lower powerline road. Looking at the GPS track above, I entered from Buckhorn Road (see here for more about Buckhorn Road) and took the dirt road that generally follows the lower of the two high-tension powerlines. It’s a great dirt road with very little scree and is mostly level with only a couple steep spots. It connects from Buckhorn all the way to Kinikin Road out of Montrose. This lower powerline road makes for a great evening ride after work—the photo at the top shows the quality of the views from the area. I’d noticed on previous trips that there are quite a number of side roads, all unmarked, some just two tracks in the dirt. I followed several, a couple of which were quite long. There were a couple places where the two-track road turned into a steep single-track—I didn’t attempt to follow these. Note that several of the roads end at locked gates. 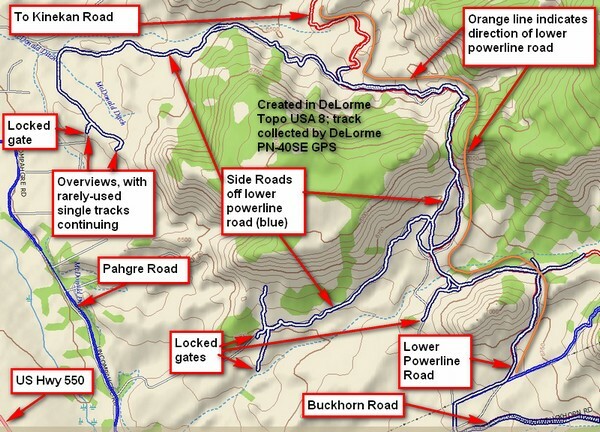 The base map shows a few roads that aren’t there or are on private property. The side road I particularly liked is the one along the top of the GPS track shown above. It’s fairly well-traveled, it looks like mostly by ATVs. It’s a fun little road with ups and downs and nothing very serious. I’d rate it beginner+ because of some rutting. When I traverse a road I’ve never been on before, I usually am quite cautious and stay in first gear. But on the way back, stretches along all of these side roads were third gear roads. I met a guy and his young boy riding on an ATV—a really old ATV—only three wheels! He wasn’t in a mood to chat, so I wished him good evening and went on my way. I have more exploration to do! I turned around because of the time. The next time I’m up there I’ll do some more exploring further to the north.